Sulphur Mountain in Banff National Park, named for the sulphur odour emanating from the hot springs near the base of the mountain, is usually accessed via a quick gondola ride. That’s the easy way to get up and down the mountain. 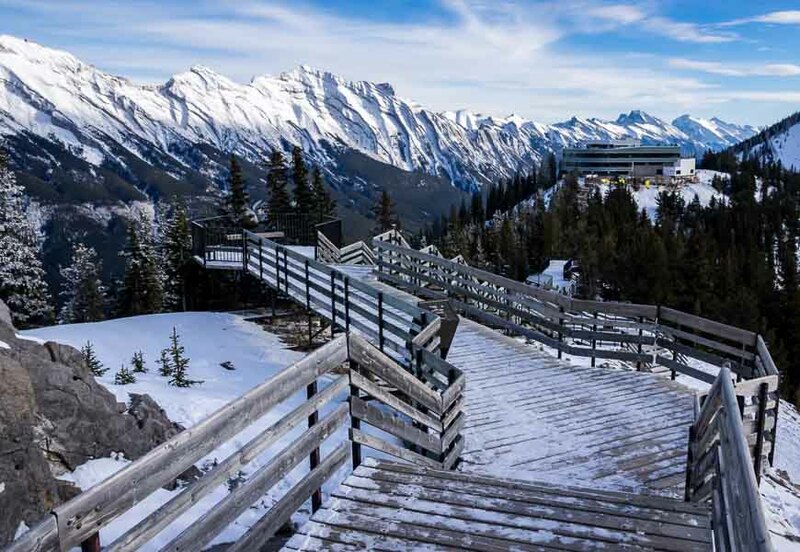 But there is the option of a Sulphur Mountain hike, actually two options but one is best in summer and the other during the shoulder seasons – October to December and April to June. In summer there’s a trail you can hike up under the gondola – which I have yet to do. 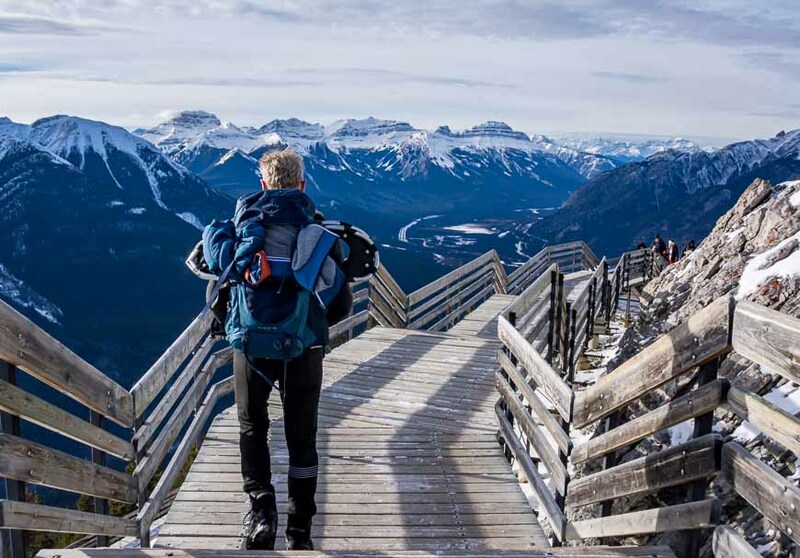 But in the shoulder-season when a hike can be hard to find in the mountains, there’s a longer option that starts at the Cave and Basin parking lot and finishes at the summit ridge boardwalk on Sulphur Mountain via Cosmic Ray Road. John and I did the Sulphur Mountain hike in November when there was snow on the ground. We took snowshoes with us because we weren’t sure about the conditions but as it turned out, we never used them. The Sulphur Mountain hike starts off on a flat trail parallel to the Bow River. It’s the same approach you would use if you were going to cross-country ski or snowshoe into Sundance Lodge. Although the signage at the start of the trail doesn’t include Sulphur Mountain, don’t let that worry you. You’re going to head towards Sundance Canyon but you won’t go that far. Instead look for a junction, 2.7 kilometres and about 40 minutes into the hike. From the sign you’ll find here, you have 5.8 kilometres to go to reach the Sulphur Mountain summit and it’s all uphill. Follow the Cosmic Ray Road for its entire length. It starts off in the trees, but once you break out into the open, about 30 minutes after turning onto the road, you’ve got views for the rest of the hike. That’s a big reason the hike is so worthwhile. There’s no chance of getting lost once you’re on the road. Just keep walking, though I have to say at times the road felt like it would never end. When you make the first switchback – most of the way up – you’ve got about 30 minutes left of hiking to reach the boardwalk. John and I didn’t see a soul on the trail from the minute we left the parking lot until we reached the boardwalk. 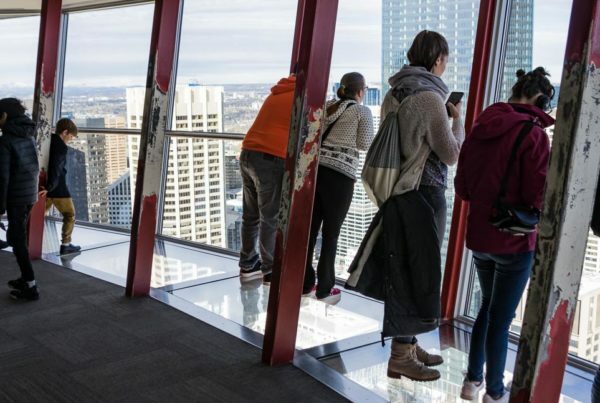 In summer, the top of Sulphur Mountain can be packed but it was cold and windy in November so there weren’t that many people that had ventured from the Banff gondola building. I highly recommend hiking to the top of the boardwalk to get the view from 2270 metre Sanson Peak. 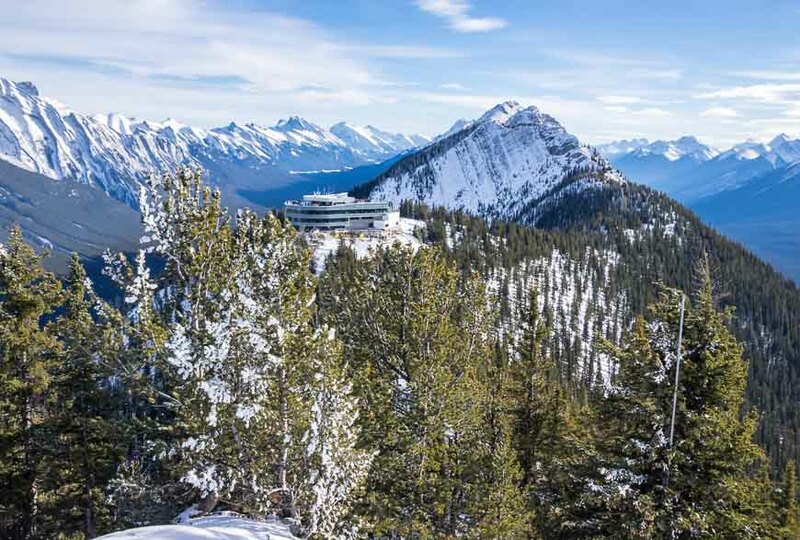 It’s also the site of a historic meteorological station called the Sulphur Mountain Cosmic Ray Station National Historic Site. Mountain views up and down the valley from here are fabulous. If you’re frozen there’s the option of heading to the gondola building to warm up and perhaps even have something to eat. Although you could take the gondola down – for a price – it can be time-consuming to get back to the Cave and Basin parking lot unless you’ve taken two cars and done a shuttle. There’s an interesting history to the Cosmic Ray Road – which sounds like something out of a sci-fi book. The road was constructed to help with cosmic ray research back in 1956 – one of nine such sites in Canada. Research was conducted by the University of Alberta in Calgary from 1960 -1978. Signs along the boardwalk describe cosmic rays as “energized particles traveling at close to the speed of light after being accelerated by our sun or exploding stars in distant galaxies.” They are believed to be the cause of the Northern Lights. It was a quick descent as the snow was just the right depth for quick stepping down the mountain. In two hours we were back at the car. All told we hiked 16.2 kilometres over five hours – though I’d plan on six hours or more as we were really moving to stay warm. 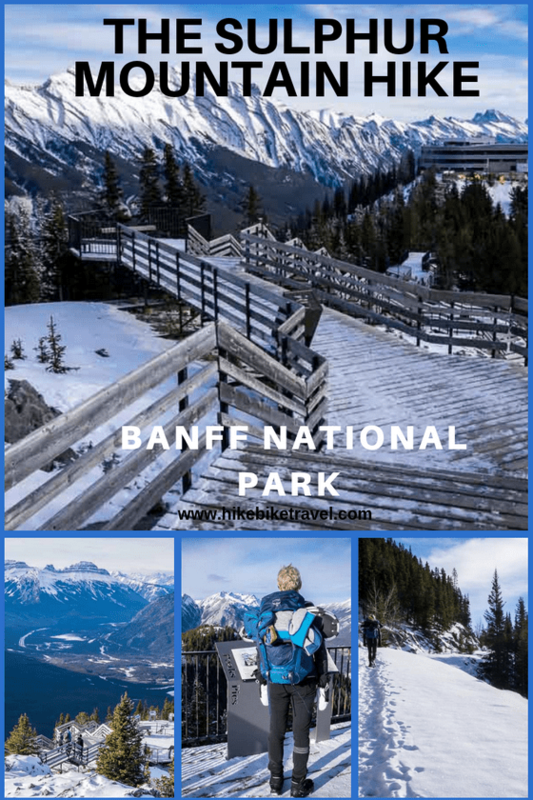 For a fall or spring outing I don’t think you can beat the Sulphur Mountain hike; great views, a good workout and the sense until you reach the boardwalk that you have Banff National Park to yourself. It all adds up to #anotherbestday in the mountains. We did the same hike on Remembering Day weekend. (1) the prime rib buffet (11am-4pm) at the summit restaurant was fantastic; (2) you have option to take the gondola down for free during winter (3) after taking the #1 bus, we walked about 1.5 km back to the Cave and Basin parking lot. Since then I took two different groups hiking up from the front and then lunch at the top. @Aldous That’s great they allow you to descend for free. Thanks for the intel.